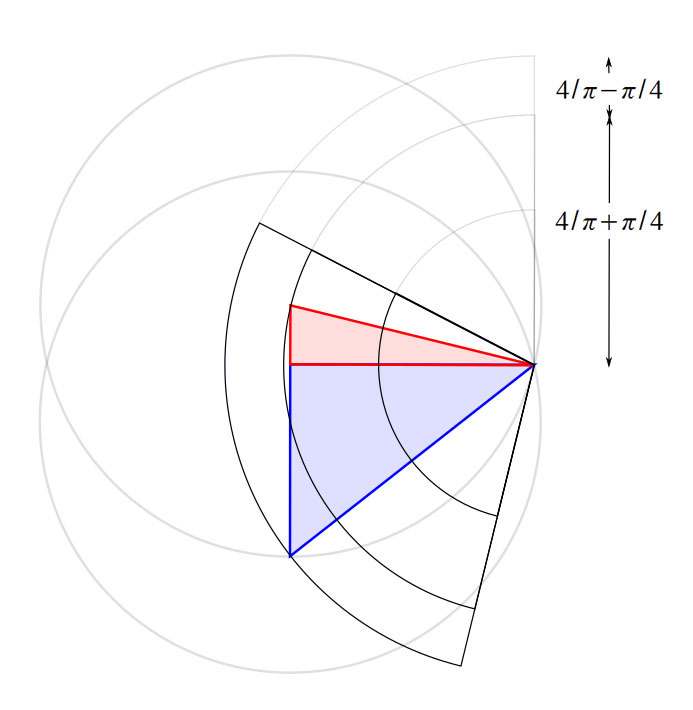 The vesica piscis is a type of lens, a mathematical shape formed by the intersection of two circles with the same radius. For every angle we get two triangles as seen here. 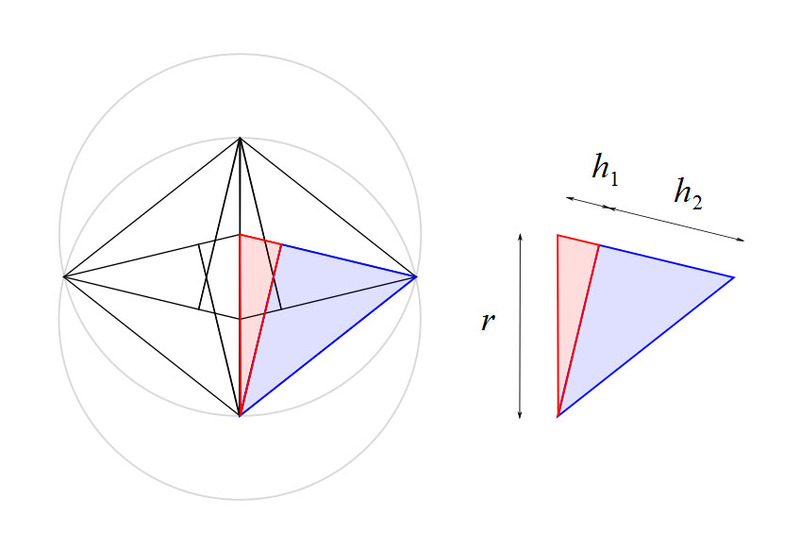 As you can see, these triangles have a very interesting relationship, for every angle the radius (r) = h1 + h2. 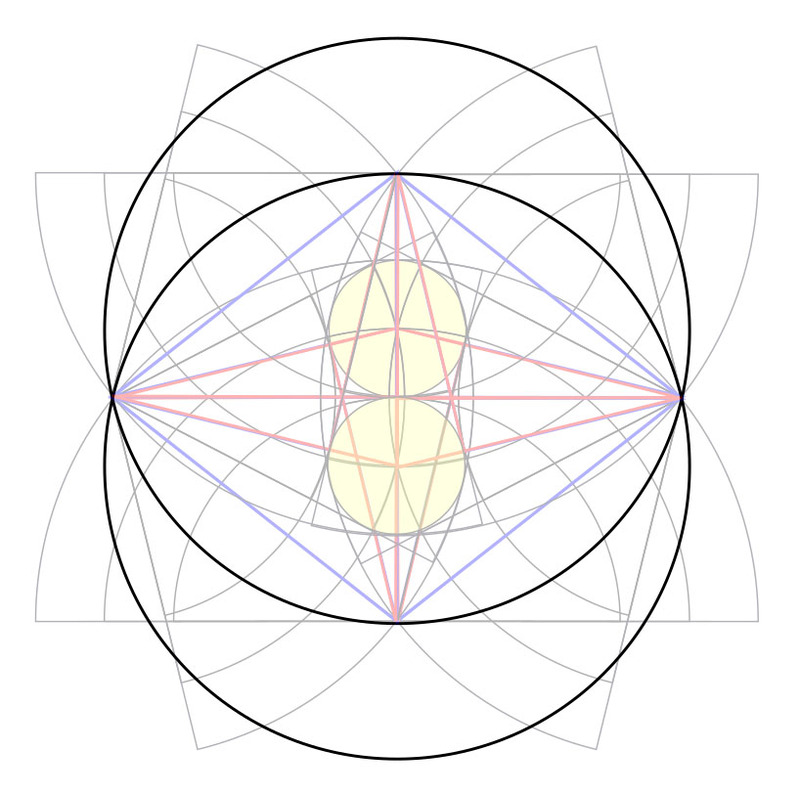 Explore the mathematics of the vesica piscis (mandorla) in detail. 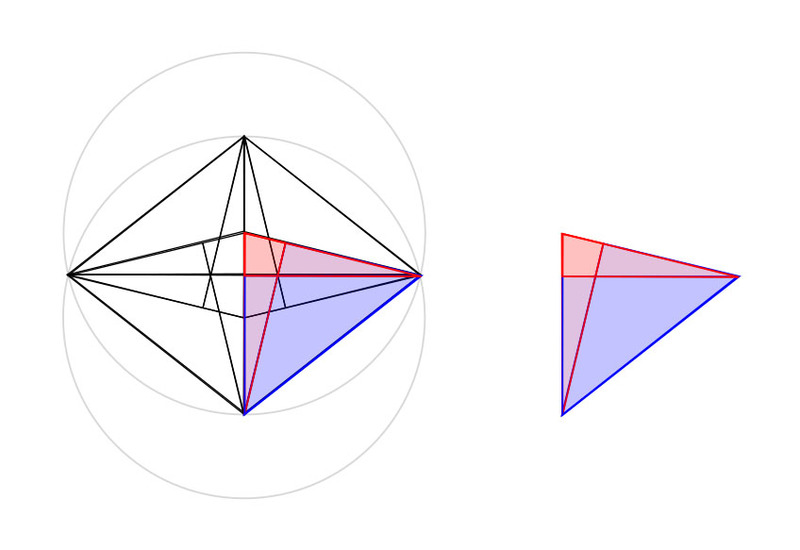 The symmetry of these triangles is shown below. 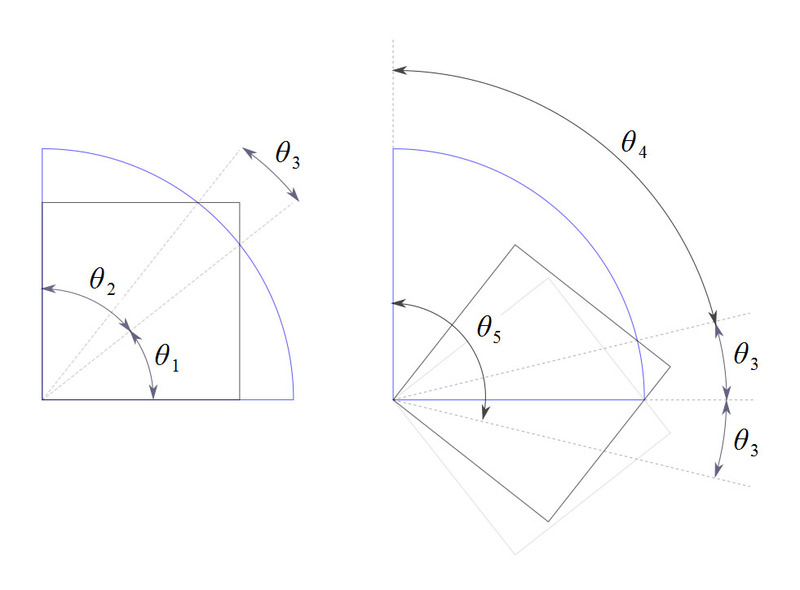 For every angle the radius (r) = h1 + h2. Showing both symmetries at once. This mathematical identity works for ALL* numbers (x). Explore the mathematics of the cosmic identity (cosmic numbers) in detail. 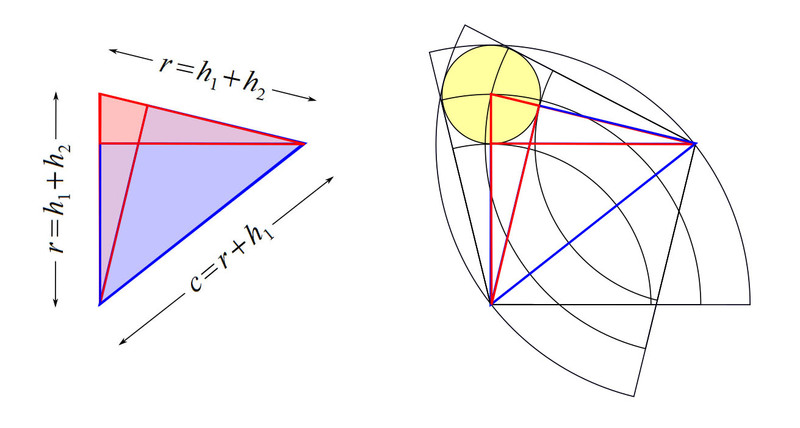 We can link the cosmic identity with pythagoras theorem to get the following cosmic triangle. 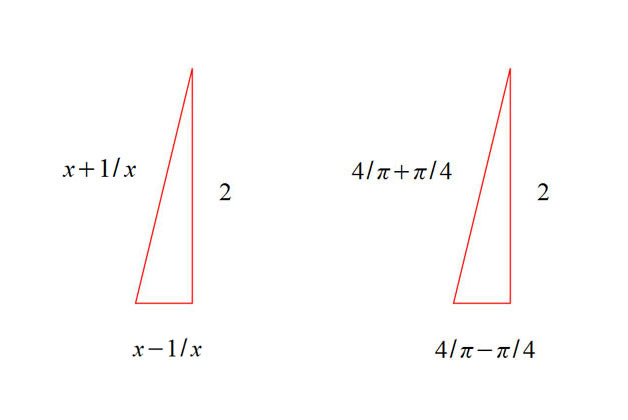 Substituting x = 4/π and 1/x = π/4 as shown below. 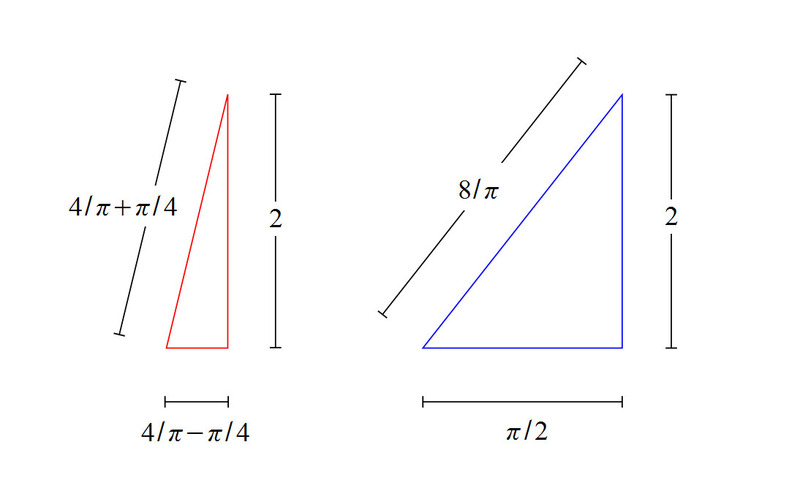 Because of the nature of the cosmic identity, the triangles above will work with any value x and π. Explore the mathematics of the cosmic triangle (cosmic triangles) in detail. 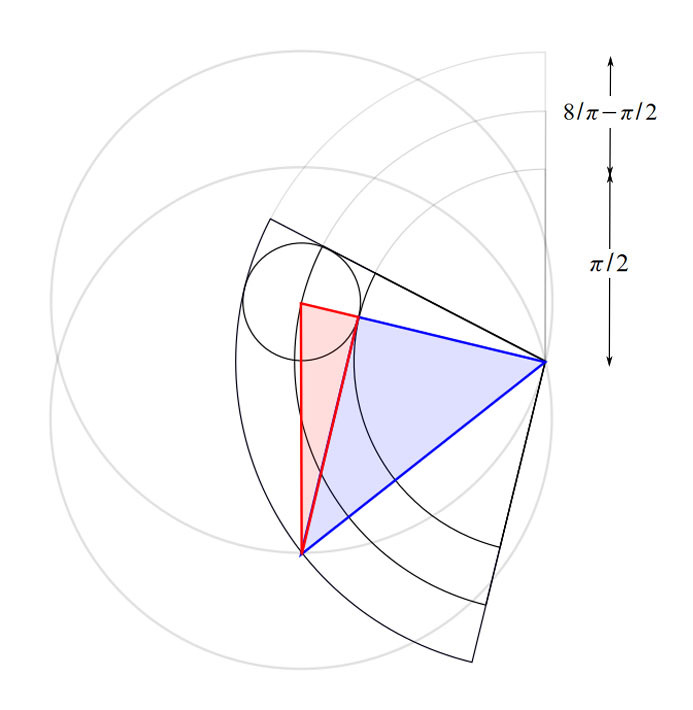 Using the cosmic triangle above in a vesica piscis, where both circles have radius (r) = 4/π + π/4. 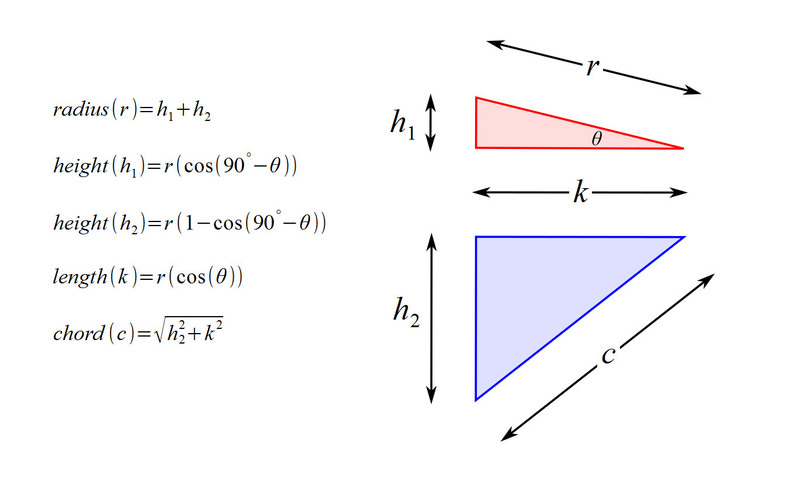 As seen below the hypotenuse of the blue triangle = 8/π. 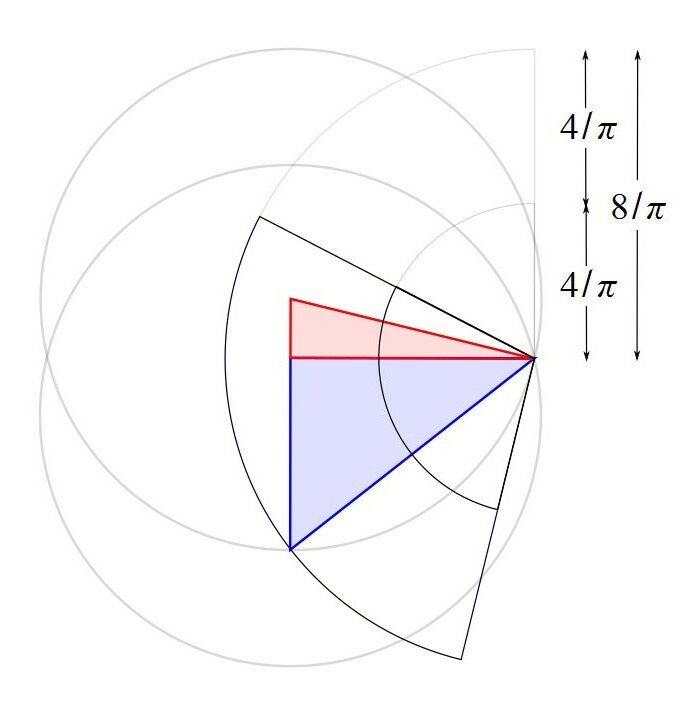 8/π = (4/π + π/4) + (4/π – π/4) and height (h1) = 4/π – π/4. 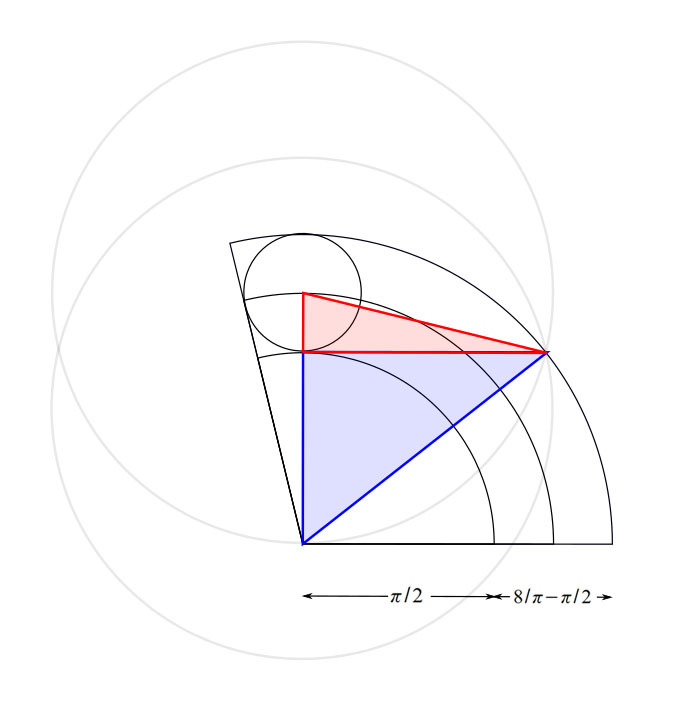 The small circle has a radius (h1) = 4/π – π/4 and a diameter (2 × h1) = 8/π – π/2. 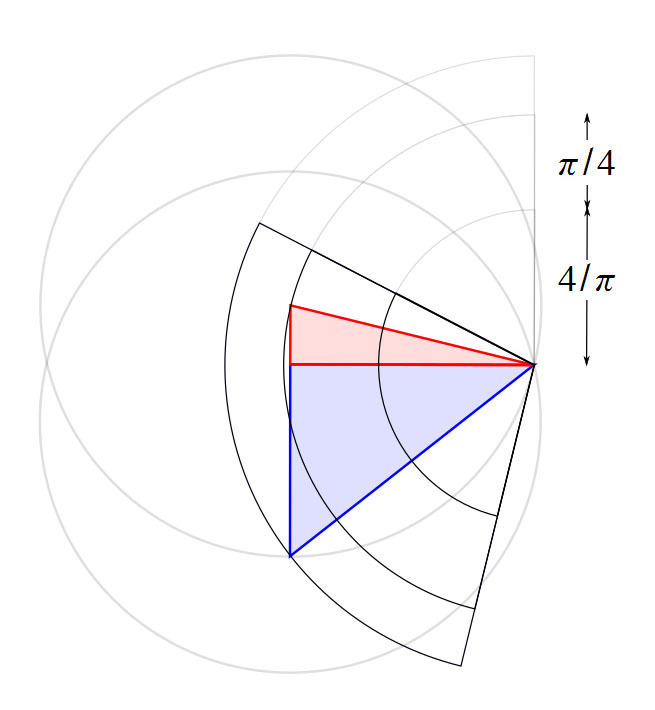 Therefore the height (h2) = π/2 = (4/π + π/4) – (4/π – π/4). Because of the symmetry of the vesica piscis. 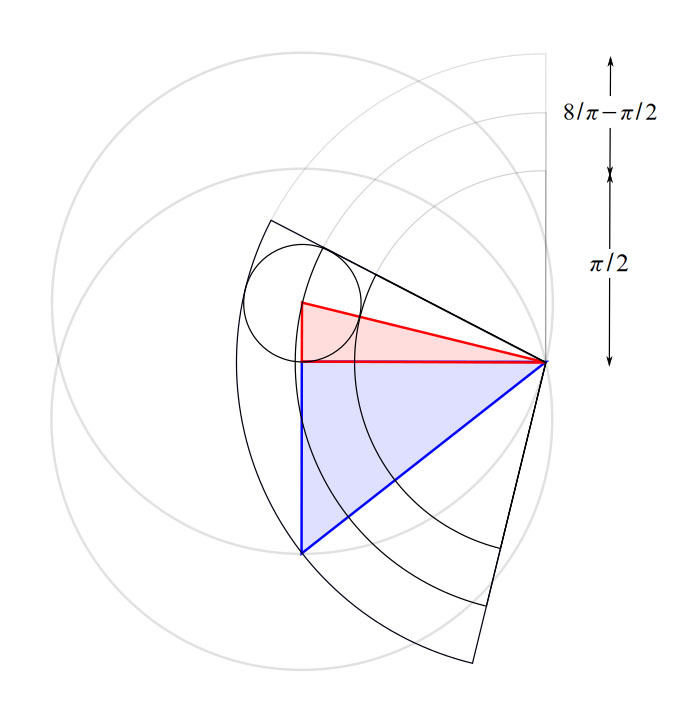 At ONLY this special angle, the chord (c) = r + h1. As seen in the mandorla. 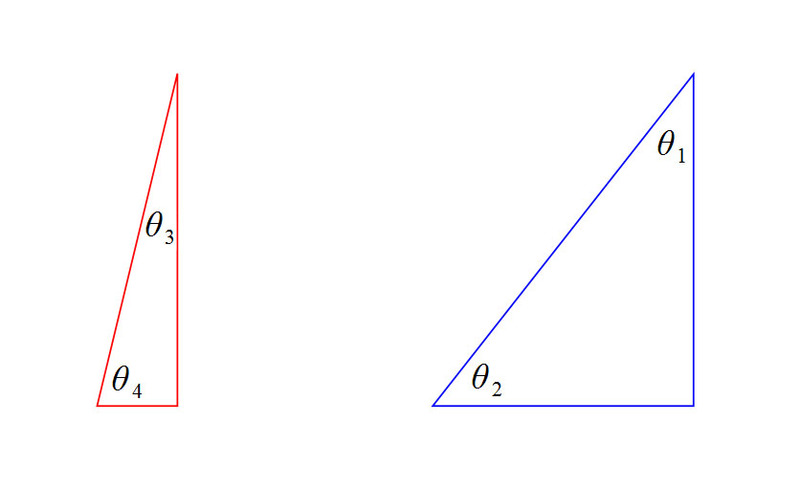 As we can see above, it seems the following two triangles must be correct. 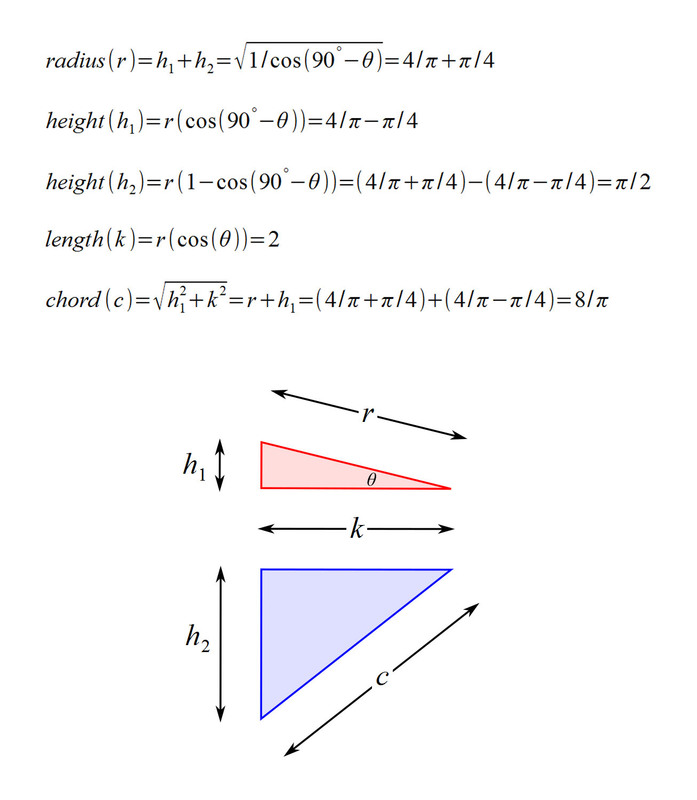 If we use pythagoras theorem and the blue pi triangle to calculate pi (π), we get the following value. This value is different to calculator pi. 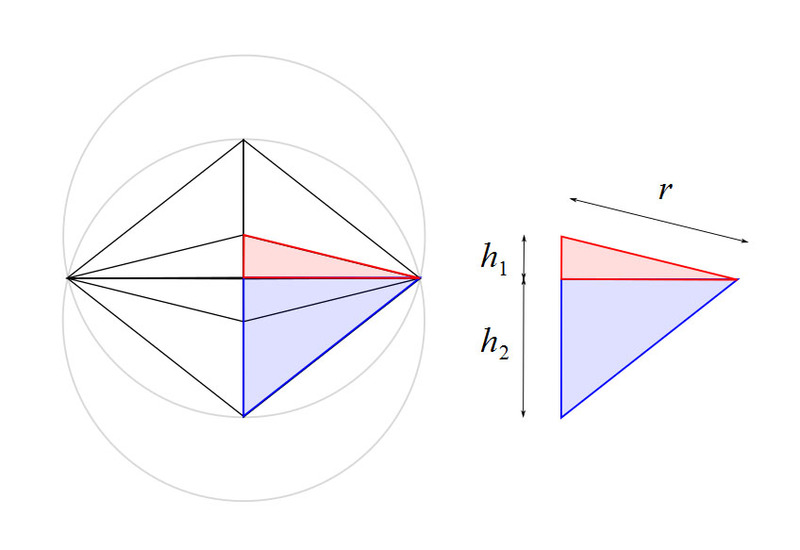 How these triangles interact in a squared circle. 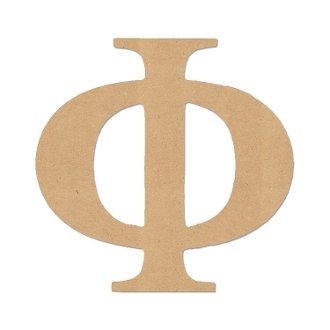 I have been told that this is not a mathematical identity because it does not work for zero (0), lets explore. Assuming that x is always ≥ 1 and 1/x is always ≤ 1, and also that the reciprocal of zero (0) is infinity (∞). As you can see, these variables always cancel each other out. Substituting 1/x = 0 (zero) and x = ∞ (infinity).